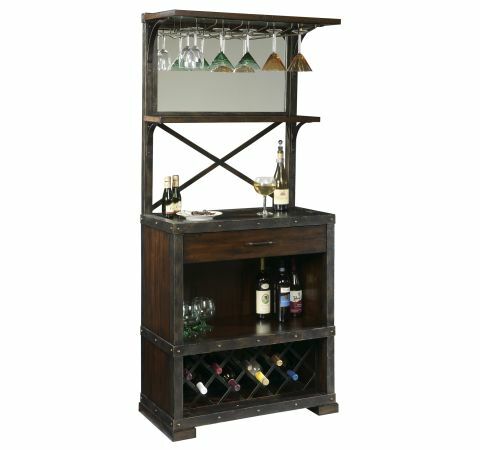 This wine cabinet features a burnished brass metal accents, and a burnished bronze bar pull with a handsome Rustic Hardwood finish on select hardwoods and veneers. It also features a decorative mirror, a metal stemware rack holds 15 large wine glasses and upper shelf for more glassware storage. The accessory drawer features smooth running metal slides and quality dovetail construction. The lower shelf provides ample space to hold your spirits and a metal wine rack holds up to 14 bottles. The Four floor levelers keep the cabinet level on any surface.